Justice IS blind – so can’t see Truth. In movies, the good guys always seem to win court cases. Over an ingratiating orchestra swell, no less. But in reality, good or bad has nothing to do with the outcome of court cases. It’s how you play the game. If you can afford to be in the game in the first place. 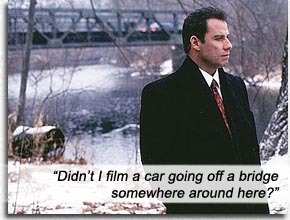 A CIVIL ACTION is based on a real life Massachusetts court case, novelized by Jonathan Harr, about a group of families suing two factories in their Woburn locale, accusing them of polluting the town water supply and causing the leukemia deaths of their children. The factories were owned by corporations, and though a settlement was reached, even as the pittance was being paid out, it broke the back of the lawyer who represented the families and destroyed the spirits of the already-shattered families. John Travolta is lawyer Jan Schlichtmann, who informs us during the opening credits that a lawyer would be doing his clients a disservice were he to get emotionally involved with their case. Then for dramatic arc, and in real life it would seem, Jan went against his own principles and tongue-kissed the case to bed every night and woke with its morning breath in his nostrils every day. William H. Macy is Jan’s accountant, who helplessly watches the firm go broke against his desperate mortgaging of all their homes as collateral and selling all their office furniture; Tony Shalhoub and Zeljko Ivanek are Jan’s snowed under assistants. John Lithgow is the forceful, biased judge, who plays golf with Facher. From the outset, Jan is battling the judge’s tripwire impatience as the new guy intruding into this Old Boys’ Club. Co-written and directed by Steven Zaillian, co-produced by Robert Redford (always into “sensible” films with something to say), A CIVIL ACTION is a success as a movie precisely because it is such a major downer. It conveys an infuriating claustrophobia, that maddening feeling that we can’t, in fact, fight City Hall, no matter what Greg Brady says. Schlichtmann becomes a shell of a man, obsessed with trying to do the right thing, sitting in his bare office with no desk, phones and electricity cut off and no future prospects. And it’s raining outside. A late scene shows young punks throwing firecrackers across a river on the contaminated land; one of the firecrackers lands in the river and the whole river catches alight. Movie ends with the Environmental Protection Agency getting involved – one giant institution against another; a clash of the Titans, if you will. In Greek mythology, only a Titan could destroy another Titan; and in the modern obfuscating world of blind justice – does anyone see the irony in that phrase? – it is still impossible for an individual to destroy a Titan, even with the best intentions and the Truth on their side. Harr’s book ends on a somber, pessimistic note, but the movie was made after the book, with more current information. Closing text informs us that the two offending corps, Grace and Beatrice Foods, were indicted by the EPA and paid 69 million dollars in cleanup costs. Jan is now representing 60 families in New Jersey in another contaminated water case. Is this guy a sucker for punishment or what? Writers: Jonathan Harr, Steven Zaillian. Starring: John Travolta, Robert Duvall, Tony Shalhoub, William H. Macy, James Gandolfini, Kathleen Quinlan, Zeljko Ivanek, Bruce Norris, John Lithgow, Mary Mara, Stephen Fry, Dan Hedaya, David Thornton, Sydney Pollack. Travolta always finds an excuse to dance. ♦ A CIVIL ACTION Dance Sighting: Intro credits montage, Travolta dances with a stray blond in celebration of a courtroom victory.